Hi friends, today I'm hopping along as a apart of the Pretty Pink Posh Product Release September blog hop. Today is the first day of a two day blog hop with a ton of inspiration using the brand new release. I hope you enjoy all of our creations! There are four $25 gift certificates to be given away in this blog hop (two per day). 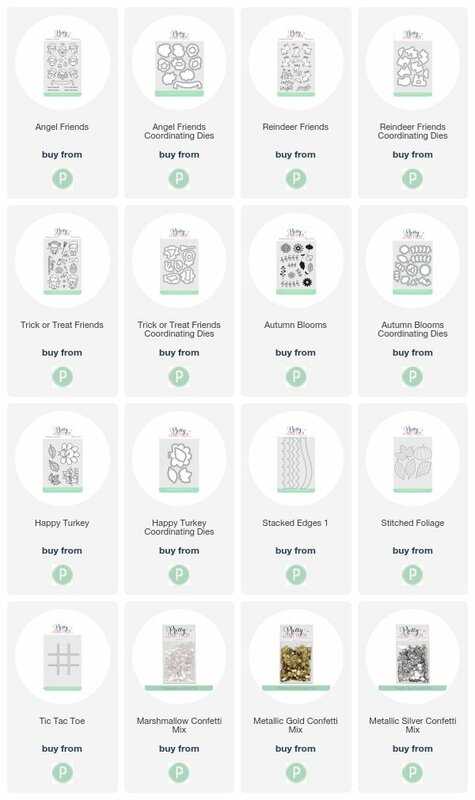 So make sure you leave comments on the blog's comments to be entered and they will then be picked randomly and announced on the Pretty Pink Posh blog. Make sure you leave comments by 11:59PM PST time on the 19th September 2017 to be entered into the giveaway! Okay, so for my card today I'm using the brand new Reindeer Friends stamp set along with the Stacked Edges 1 Dies. I'll also be using the Storybook 4 Dies as a place holder for my scene. First up I stamped and coloured my reindeer images with Zig Clean Color Real Brush Markers. I then used the coordinating dies to cut them out. I then used the Storybook 4 Dies to cut out a panel of white cardstock. I kept the insides of the die as I wanted to use them and I also made sure I cut the frame int he centre of my panel so I could use that on my card too. I then took all the inside pieces out of frame and inked some Broken China onto the top three pieces and then a little Shabby Shutters onto the bottom two pieces, just to give them a little something extra. I also stamped the sentiment with black ink 'Jingle All The Way' on the middle rectangle piece. I then used some red, green and gold cardstock to cut the wavy die from the Stacked Edges 1 Dies, once out of each colour. I then used the new Knit Picky paper pad for a subtle grey patterned paper and adhered that down onto a card base, then stacked the wavy pieces I die cut on top of each other into the middle of my background. I added foam tape onto the back of my frame pieces and the inside pieces and adhered them down into the centre of my card. I added more foam adhesive to my reindeer images and also adhered those onto my scene as well and that finished up my card. Thanks so much for stopping by today, the next person on the hop is Kelly Latevola, make sure you continue to hop along, leave comments to be entered to win some gift certificates! Those reindeer are just too cute! Your card is so gorgeous and I'm ss excited about the new release the deer are too cute. I love seeing new products on display....so many talented gals! Loving the sentiment Jingle all the Way!! Wow!! These reindeer are perfection!! Thank You so much for your beautiful card and video!! 💖💕💖😍!! What an adorable card!!!! Love It!!! Just adorable! Love the coloring with the Zigs. Gorgeous card design with those adorable images!!! Soooo cute!! I love how the one deer is holding the present! So sweet, love you coloring - it's perfect! So cute! The reindeer are so adorable! Cute reindeer. Love the little packages! Oh my goodness! Simply adorable! This card is so cute. I love the coloring on the reindeer. You did a great job with this card. Those little reindeer are just so cute. Very creative. So cute! I love this stamp set! Adorable card! Love those little reindeer! Sooo cute! Can't wait to see all the cute creations from this new release! Super duper cute card!!! I LOVE those darling little reindeer!!! The reindeer are so sweet and perfect for any holiday greeting. The pop of color along the side was perfect. Thanks for sharing. Love these cute little reindeer and the scene you've created! I like how you took the time to add the swooshes in the background. The devil really is in the details. Lovely! Love the reindeer and your clever card design! Super sweet Eloise, this is an adorable set, love the 3 strips on the background. So cute and I'm so glad you used that storybook die so I can see it! Love it! Love the Deer and the Stitched look of the dies you used. Oh the card is so stinking cute and I love the reindeer. Love, love, love those adorable reindeer!! Your card is SO cute! So cute! Love that reindeer set. Great colouring. Awesome card ! I love the idea of the waves for the background. Your reindeers are adorable ! This card is super cute and I love the flash of colour behind the main panel, I love it! ADORABLE!! Love the way you used those darling reindeer. These reindeer are so stinking cute, I think I'll have to adopt them! I just love your card! How cute! 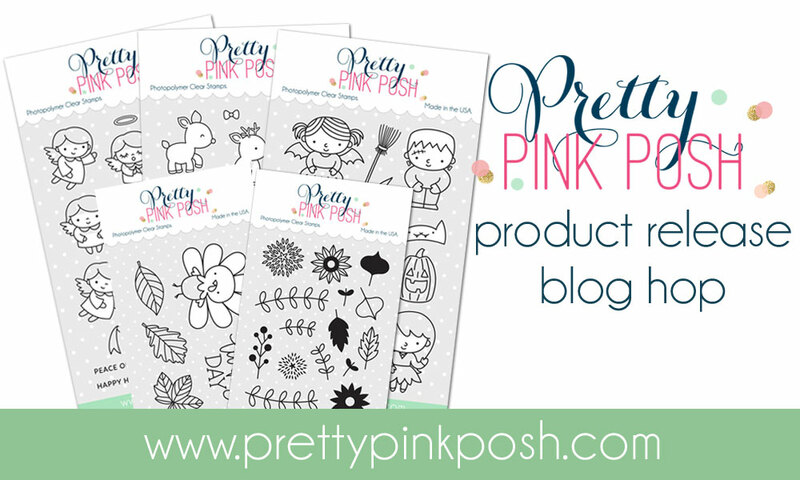 I love this stamp set and you've really showcased it beautifully! Super cute scenes of reindeer, love the Storybook diecut ink blended background! So stinking cute! I love those reindeers! Great card. So cute and your card is fabulous! Love your card! It's so festive. It's such an adorable card !! I love your coloring job ! I love this picture frame type scene on cards. Great job & thank you for sharing. Looks like a fun card to make! Cute card! Those little reindeer are just too cute! Loving the reindeer and the angels in this release!Thanks for sharing on this fun blog hop. Very cute card, Ella, Beautiful coloring! Lovely card love the reindeer! Great coloring! I love the coloring on your adorable card! These deers are so cute, beautiful card ! Just love this stamp set, these deer are adorable! What a fantastic card! I love the soft inking you did on the stitched panels! Your reindeer card is so bright and cheerful! One of my very favorites! They really put me in a holiday mood! Oh my gosh! These little reindeer are so cute! I love the coloring! Really cute card! The reindeer are adorable. Your card is so cute, love the reindeer! Love the new stamps and dies! Your card is adorable! The reindeer are absolutely darling! Beautiful card. Oh, those reindeer are so darn cute. Love the items in this release! Adorable card. I'm in awe of your inking on those due pieces. I have such a heavy hand. Great inspiration! I love the cards - those reindeer are so cute! Thanks for sharing your ideas... your card is really cute. Your tiny reindeer card is adorable and I love the storybook 4 die you used too! Thanks for sharing. What an adorable little scene, I love how you put this whole card together! Love the reindeers with the stacked dies! Just perfect! This card is so cute! I love these adorable little reindeer! The colored border dies in the background look great, too! I love the colours you used on your card. Thanks for sharing your technique video. Love the card. Looking into the Stacked Edge dies.. out right now. But will be keeping my eyes open! Such a cute card!!! Love those reindeer! Love the reindeer, your coloring, and the stitched dies. Thanks for sharing! 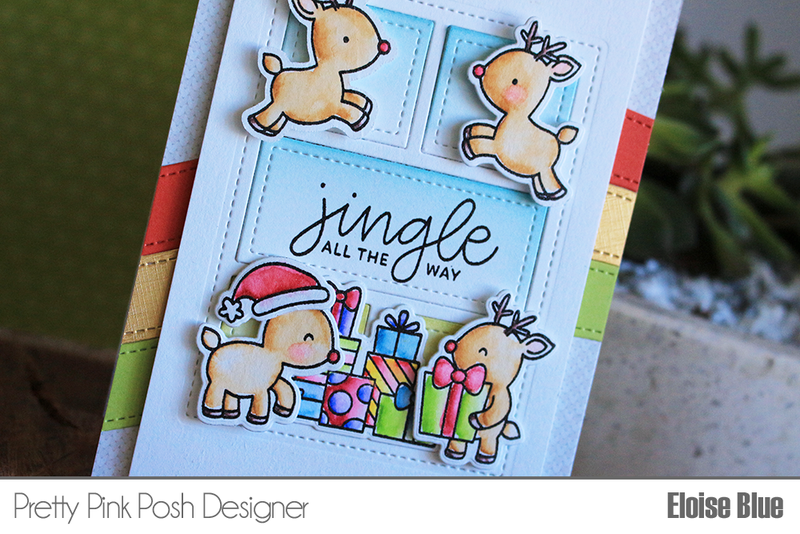 Your whimsical card is adorable and I love the seasonal sentiment, "Jingle All the Way." What a great card. Those reindeer are adorable. Great colours and use of all the different release products. Such a cute card. those reindeer are so adorable! What a fun card! Those flying reindeer are adorable! I love the ribbon of Christmas colors colors in the background! Wonderful cards. the reindeer are so cute! Oh, what a darling card!!! I love the new stamps you used and the way you created the colorful background with the new dies!!! Such a cute card. Love the reindeer! I just love these reindeer. They are delightful. You made an adorable card! I realy need to get those reindeer! Those reindeer are so cute. Great card. Thanks for sharing. Oh my goodness! So clever to use the dies with these adorable reindeer!! You are engenious to have them on all the levels!! Gorgeously colored as well!! Nice card, scenic and do able.